Picture this: A white American man travels to West Africa, gets cast in a Nollywood film, and is possessed afterwards by a ghost. This is the plot of PASTOR PAUL, a film that director Jules David Bartkowski is calling the first of its kind. The film explores the remarkable confluence of New African Cinema, Christianity and Witchcraft, undermining the classic symbolic imagery of the “white man in Africa,” whether he be tourist, missionary, actor, or ghost. 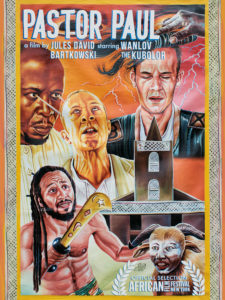 Filmed in Ghana and Nigeria, Pastor Paul is the result of a guerrilla-style international co-production with Pidgen Films. It is the first American Nollywood film, an homage to the spirit – and spirits – of Nollywood’s self-determined narratives. In-home/personal use copies of the DVD are available on Amazon http://amzn.to/2HHhews. Or stream it if you prefer https://amzn.to/2rOdbZB.